Original copies of this book have changed hands for hundreds of pounds. It’s that combination of scarcity and popularity that encourages that monetary phenomenon. The author, Arto der Haroutunian, died in 1987 so his books are valued as a resource that will never be replaced. Arto was only 47 years old when he died. Middle Eastern Cookery is considered by many as Arto der Haroutunian’s finest work and perhaps the seminal work on the subject. This must surely be one of the most eagerly awaited reprints, so highly is it regarded by culinary professionals and home cooks alike. Arto begins with a charming preface; don’t skip this as it sets the scene. Arto talks of his family, now living in Manchester, and of their love of food and their generosity. He describes with warm emotions tables groaning with his mother’s delicious food and tells of numerous guests who shared and appreciated those tastes of “home”. “Home”, for Arto, his family and friends was the Middle East. The Arab States, Israel, Syria, Lebanon, Iraq, Turkey, the Caucasian republics of Armenia, Georgia and Azerbaijan, and Iran broadly represent that area, and the recipes of that region are the focus of this volume. 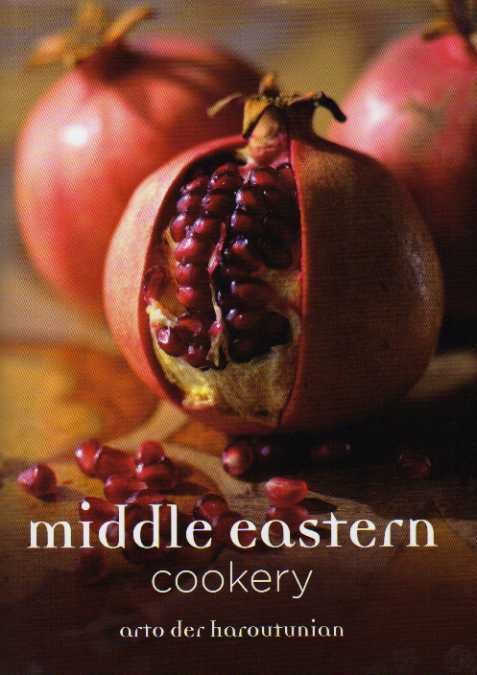 This is possibly the most comprehensive Middle Eastern cookery book available. OK, so it doesn’t have the padding of sumptuous photographs but Arto’s writing paints the most mouth-watering images. The recipes are, for the most part, simple, relying on the freshest and best of ingredients to give both flavour and texture to the dishes. The recipes are authentic, being popular family recipes from every corner of this fascinating but too often war-torn landscape. There are plenty of recipes here that will bring joy to the heart of many vegetarians. Arto’s mother gave him plenty of culinary advice, (mums are like that) and one of those pearls was “Never serve boiled vegetables. Fry, stew, braise, pour sauce over, but never boil in water.” I think those wise words probably hold good for all of us. The Ganachi (Cooked Vegetables) chapter offers an interesting selection. Kurdish Vegetable Stew is seasoned with cinnamon and has a crunch from walnuts. Nuts are also used with Shesh Havij (Carrots with Nuts) from Iran. It’s a dish garnished with both almonds and pistachios and a drizzle of pomegranate juice. Lamb is the most popular meat in the Middle East so it’s no surprise that it features here. Lamb with Saffron and Almonds is found in North-West India, Pakistan, Afghanistan and Iran, from where it originally hailed. It’s easy and exotic with warming spices. Hamuth Helou is an Iraqi lamb stew with dates, apricots, prunes and raisins. Rich, sweet and aromatic. I would, to be honest, be happy to eat my way through every dish in this book… er, well, um, apart from perhaps Hooves, Tongue and Tripe Stew but then perhaps I am a picky eater! Middle Eastern Cookery is rightly a prized and appreciated volume. You will be happy that you don’t have to pay hundreds of pounds to enjoy this classic book.